Cindis World: Would your DAD like a Victorinox Swiss Army knife? 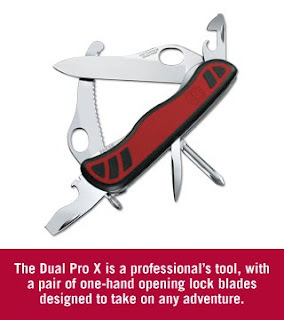 Would your DAD like a Victorinox Swiss Army knife? I can remember my Daddy always carrying a pocket knife...it seemed like whatever might need to be fixed, or adjusted, could be handled with the pocket knife. Then when my children were younger, their Dad gave each of them pocket knives ( I totally freaked of course). And to this day, my son who is going on 20, has pocket knives. I have no clue what he does with them, or why, he just does. A truly fond memory I have is of my then father in law whittling. We would be out in his workshop, him on his stool, and he would be whittling something. He made all kinds of things, small toys, figures, and even canes. I remember thinking, I cannot believe people in real life do this, am I living on Walton's Mountain? And any one of you who have no clue what I am talking about .... then just realize its cause I am OLD, lol. Well, with all of these memories, it makes me think I should encourage my son to remember also, since my Daddy, and my ex-father in law have since passed away. I think the Victorinox Swiss Army Dual Pro X would be a wonderful gift to help preserve some wonderful memories for my son. Pretty nice right? You can go over to swissarmy.com and check it out for yourself. Also be sure to go here to the Share the Adventure Facebook Page and become a fan to participate in Share the Adventure for a chance to win great products and compete for a $25,000 Ultimate Adventure !